The existence of light-sound beings was a well-kept secret among shamans. Joska Soos was initiated in sound, the highest levels for a shaman. He then began to perceive these beings with increased intensity. He was of the opinion that the consciousness of humanity is changing, with more and more people ready to receive this kind of knowledge and experience. This is why he decided to reveal this closely guarded secret, in spite of some angry fellow shamans. 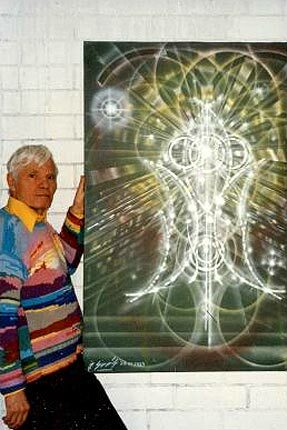 Starting in 1950, he made numerous paintings and drawings of these beings, and he spoke about them to those who were able to comprehend it. Since the 1980s people with spiritual interest started to come to him to learn and experience. Not everybody can see and connect with the light-being portraits in his artwork. But when you can recognize them for what they are, then they can bring some powerful and positive energy in your life. So, what are these light-sound beings? These beings exist at the levels of consciousness that correspond with light (the sixth level) and sound (the seventh level). Light and sound underlie all creation. Light and sound vibrations are the foundation of the whole of the universe from which the other levels of consciousness (the first to the sixth level) and forms flow forth. In other words, the light-sound beings are the creators of the universe. They create and maintain whole galaxies, star systems, planets, everything that exists, from the large to the small. Because they exist at the sixth and seventh level, they have no form in the sense that we are used to. When experienced with the inner eye, they appear in forms that look like abstract art. In reality, they appear as geometric forms, like circles, lines, signs that look like musical notes, and so on. All these lines consists of pure white, intense light that also has sound frequencies. Joska Soos’ first experience with a light-sound beings happened in a coal mine. In exchange for a permanent residence in Belgium (after the second World War) immigrants had to work for five years in the coal mines. When the miners of his shift left the mine, he would stay behind, turn off his electric light and remain there until the next shift came an hour later. Being in the absolute darkness and silence he was able to expand his consciousness and feel special vibrations. One day the sound-being of Christ in the form of “I am the resurrection, I am life” appeared to him. Joska Soos was so scared by it that he didn’t dare to stay behind anymore for several weeks. Later on the light-sound beings appeared to him while he was shamanizing for people, with a dark blue background and at a great distance. In the beginning he wondered why they didn’t come closer, or why he couldn’t get closer to them. When he tried to get closer he would always hit an invisible wall, hard as diamond, at a certain distance. The inner voice of his master told him that diamond is as sand compared with the hardness of this “wall”, which was much harder. Then he would enter another consciousness and hear sounds. After a while the sounds stopped and only silence prevailed. His inner teacher instructed him to continue with his drumming. After a while he would hear other sounds, and silence again. This process was repeated many times for more than two years. During this time light-sound beings were sending him knowledge and energy. He understood the sense of silence and songs, and why he was not able to approach the beings. One time he did manage to get very close to a light-sound being. Suddenly he was hit in his neck and fell unconscious. He was in a coma for six hours and couldn’t remember what had happened. He could only remember that he was hit in the back and that an extreme heat was running up his spine and leaving his body through the neck. Actually it was not heat, or cold, but something quite different. The next day he shamanized again and saw the same light-sound being. His inner guide told him that it was dangerous for humans to come too close to those beings. They are so powerful that they can be looked at only from a great distance. Even from star-distance they will communicate to humans what they want to convey. You don’t have to be a full-blown shaman to be able to see the light-sound beings. In one of Joska Soos’ workshops I met a man who was a spiritual seeker, but not a shaman. He had just visited a region in France where a lot of petroglyphs were found in the mountains. Worth mentioning is that this region, which apparently was an initiation place for people thousands of years ago, has a rich uranium content which makes the soil and rocks slightly radio-active. While meditating there he suddenly came into contact with and saw the same light-sound beings Joska Soos had been talking about. He had not intended to see them, it happened spontaneously. Over the years I have noticed that people who first see Joska’s paintings are either very attracted to them, or they do not connect to them at all. Joska Soos has had many expositions in Belgium, Holland, Germany and Yugoslavia. A friend of his, an art dealer, once said to him that his paintings are very beautiful, but that the public is not yet ready for them. Joska Soos was ahead of his time. 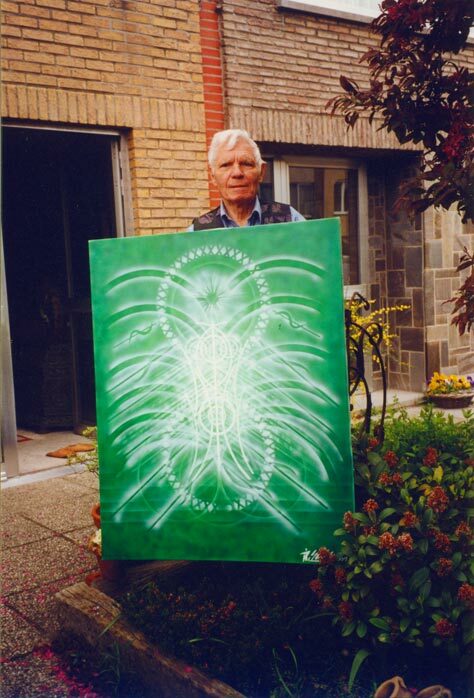 I should emphasize here again that all his paintings are of light-sound beings or light-sound energies that he saw with his inner eye. He painted what he saw. He did not invent them. They are real and Joska painted them as they truly are. I, myself have seen them on two occasions.